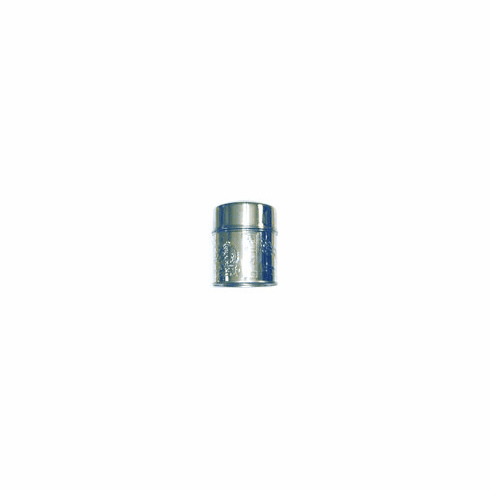 TenRen's stainless steel canister holds approximately 2 ounces (55g) of loose tea leaves. For small or tightly rolled tea leaves, such as Pearl Jasmine this canister holds 0.2 lbs or 3.2 oz. For large tea leaves, such as Pouchong, this canister holds 0.06 lbs or 1 oz. This canister is approximately 4 inches (10 cm) tall and its base is about 3 inches (8 cm) in diameter. This canister comes with a single lid embossed with the TenRen logo and the side of the canister is embossed with two dragons playing with balls of fire. Dimensional shipping weight is 0.45 lb. The interior of the canister can be rinsed out with warm water. Towel dry the interior and let it air dry in a warm environment. If one plans to store a particular tea in the canister, we recommend that a very small amount of tea be placed inside the canister and shaken for several minutes with the lids in place. This procedure will enable the leaves to absorb any other odors remaining in the canister and impart the appropriate fragrance for storage of the tea.